The Mill House Halloween Party - Join us for a howl and a groove! 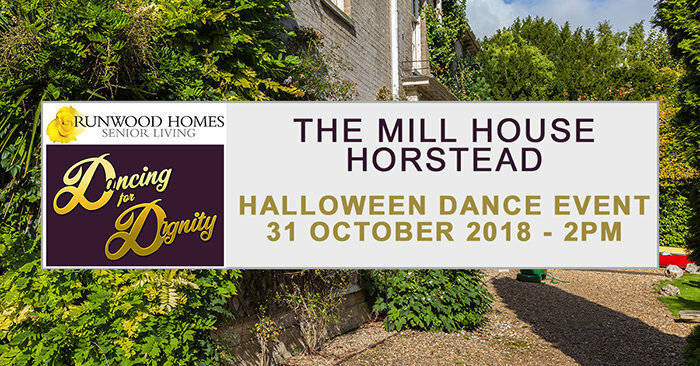 The Mill House residential care home in Norwich is holding a Halloween themed ‘Dancing for Dignity’ event at 2pm on 31 October. Please join us for a howl and a groove! The dance event, open to residents, relatives, friends of The Mill House and visitors from the local community, will start at 2pm. Please feel free to come in Halloween fancy dress and give us all a friendly fright. Join us at The Mill House, Mill Road, Horstead, Norwich, Norfolk, NR12 7AT. Entertainer, Tony Cann will be singing and dancing. The Mill House residents, families and staff will all be joining in with the dancing. The Halloween dance is a very popular event in our community. Win a great prize from our raffle! All monies go back into the Home for the residents. For more information, call 01603 737107, email mill.house@runwoodhomes.co.uk. Please visit The Mill House web page by clicking here.